Fat Bruce Lee and I had the opportunity to take a couple of new friends to a spot that they would likely not have discovered on their own. We choose JNJ Burger and BBQ, because it was an out of the way spot that happened to serve terrific, simple burgers. It was one of our favorites when we reviewed it last year, and we were curious if it had held up. It did. We each ordered from the walk up window in front of the burger stand. A single Cheeseburger ($3.00), an order of fries, and a can of soda--total: $6.47. Seating was around the back under a permanent awning...gravel and plastic furniture with tablecloths was the scene. The smell was fantastic, since the other half of JNJ Burgers was BBQ. The smell of hardwood smoke and meat filled the air for blocks. Our meals arrived in just under 10 minutes. The Beef: This was the same Johnny Rockets blend of mostly Chuck that we had last year. There was no aging, so no funk. The meat was pleasantly beefy, it had a really nice, even mineral note to it. The Well-Done burgers managed to be juicy in spite of the high cooking temperature. This certainly served to render off the excess fat, and it melted the collagen to provide us with the best of both worlds--lean flavor. The burger was firm but not chewy. 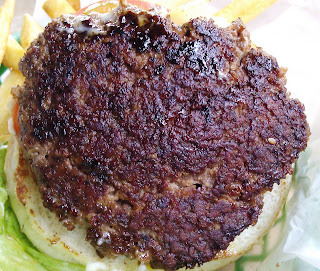 The Seasoning: The exterior of the burger patty was dusted with a salty mix of spices, and this enhanced the flavors of the well-seared patty. The Sear: The sear on the burgers at JNJ Burger Shack was a thing of beauty. It was even, deep, dark, and CRUNCHY. This was the product a properly hot and well-seasoned griddle. The Preparation: The 5 ounce burger patties were formed by hand. The beef was delivered pre-ground by the purveyor. The burgers were cooked to Well-Done on a monstrously hot flat-top, which we could hear sizzling as the lunch crowd had their orders filled. The burgers came dressed with lettuce, tomato, mayo, and grilled onions. This was our second visit, so we did not request the toppings on the side. That was where they ended up, though. The burger was just fine plain. I found that I was better able to savor the perfect sear without the added moisture from the veg. The Cheese: A slice of American cheese was draped over the burger as it was being assembled, and this melted as the heat from the burger and the toasted bun warmed it. The cheese added all of the right touches to this dish: creaminess, umami, and savory. The Bun: This was a Sarah Lee quality bun, which was just fine. The double toasted, seeded bun was moist and just yeasty enough to make its presence known. The bun was just fine, although a touch too large for the single cheeseburger. The Meat To Bun Ratio: The bun was better suited for the double (standard) burger at JNJ Burger Shack, so the ratio leaned toward too much bun in the case of the single burger. 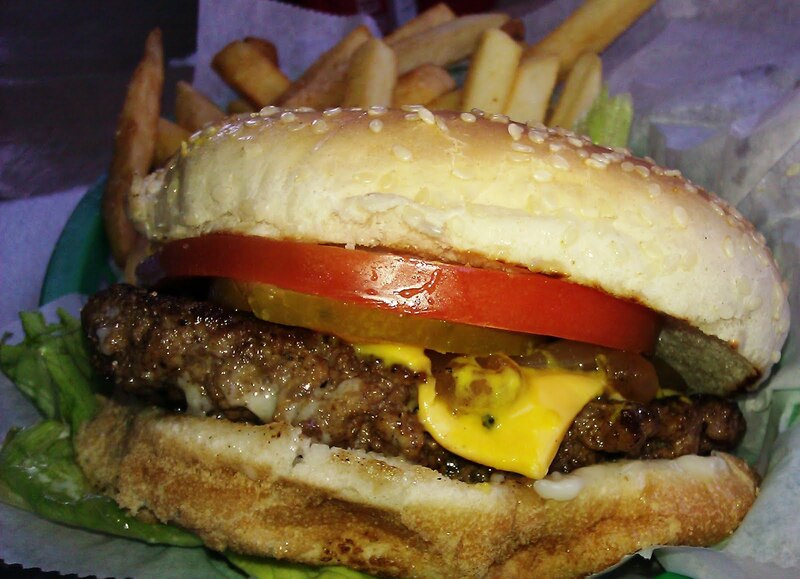 If one kept all of the toppings on the single cheeseburger, then this bun would have been close to perfect, however. The Fries: The previously frozen fries were not as well cooked as they were on our previous visit. 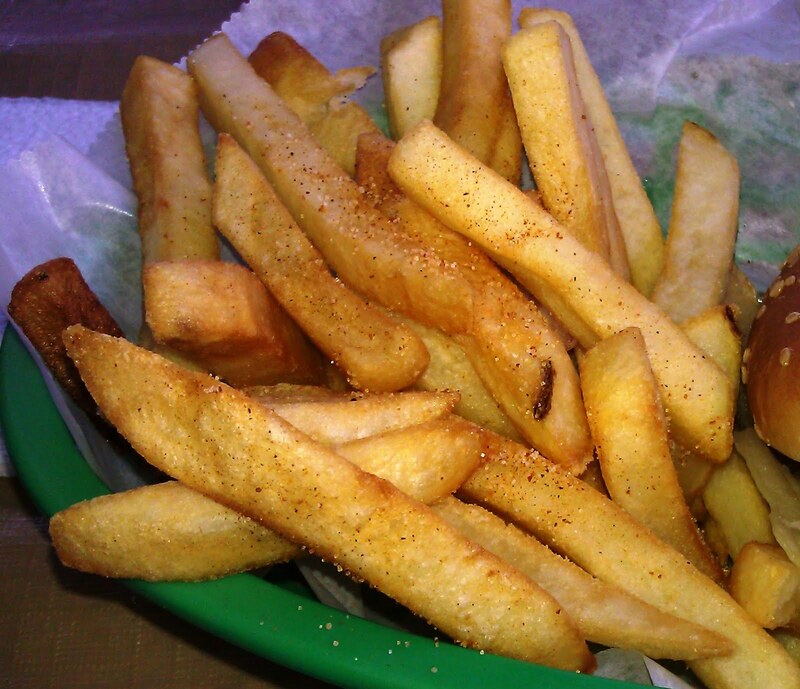 As a result, the fries did not retain their crispness for more than a few minutes. That was a blessing in disguise, since I had no business eating a pile of fries, anyway. They were well-seasoned. The Value: It was about $6.50 for a tasty cheeseburger, fries, and a drink. The value was just fine. We were pleased to see that JNJ Burger Shack had maintained its quality of ingredients and preparation. Burger Review : A tasty cheeseburger at a tasty price at JNJ Burger Shack.